This article explains the cause and solution to the CODESOFT problem that causes printer settings to inadvertently change without user intervention. Printer settings stored in the printer can be ignored and overwritten after running a print job from a different label and/or a different computer. This can happen when the label design and/or driver is set to ‘overwrite printer settings’. If a label design is set to overwrite the print settings and the following label design in not, then the printing of the second label will be affected by the settings left in the prior label. Thus this can create a confusing situation where the first label, printed at two different times (first and last), will print differently since the second label changed the printer settings in between the two print jobs. Similar situation can happen because of conflicting printer driver settings when printing from two different computers to the same printer. If the first computer has drivers that are set to overwrite the printer settings and the next label job is sent from a computer where the drivers are NOT set to overwrite the printer settings, the second label may print differently than before (since it is affected by the settings of the prior label). Change the setting in the label design and/or printer driver not to send the printer setting commands. These options are not available for all printer drivers. Also, they may be identified differently for each driver. 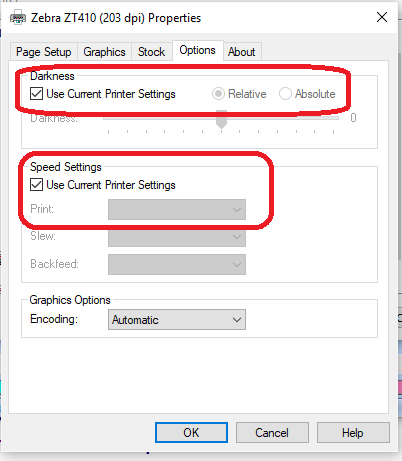 In the example below, by checking the two ‘Use Current Printer Settings’ boxes, the user tells the software not to send the commands to change the Print Darkenss or Speed to the printer.